What an interesting broom. Wonderful colors and details! What a beautiful broom -- I've never seen anything like it! It's a piece of art in itself and you've painted it very well. I didn't think a broom could be beautiful but you have proved me wrong! Lovely work. This is a terrific sketch. Really amazing work. I must say, I have never seen such a beautiful broom! Lovely, lovely sketch. Oh my goodness, such lovely detail in the bristles! I am guessing that you're using watercolor pencil for this one, which is probably the perfect media for it, or it could be just watercolor. No matter what(I need to stop thinking technical all the time now...teeheee) it's a magnificent piece! I fell in love with the texture, the colors, the depths..and all the shadings you did on the bamboo parts and strings that tied them together. GORGEOUS! Who ever would have believe that a broom could look so romantic! You may start a new interior design fad with this! If I had a brush that nice I might be more encouraged to clean! Lovely piece of work. This is lovely and such a beautiful broom!Great colours. That is absolutely lovely! I would hate to use it for sweeping!!! Wow! That's the fanciest broom I've ever seen. Awesome work! I can "feel" the straw. You have really done a good job of capturing the look and feel of this delightful broom. I'm glad you like the broom, these are used to sweep the streets of Hong Kong and the paths of Lamma. They are great for outdoor sweeping, although I haven't used mine yet. In the old days they were totally made from bamboo but the plastic packing tape has replaced the bamboo bindings. More practical but I imagine they were beautiful made completely from bamboo. Alex, started off with watercolour pencils but swiftly moved to watercolour...what colour are your new shoes? I'm curious to see what they look like on feet. Absolutely gorgeous! Wonderful technique -the colors, the detail, the depth- perfect! I agree with the others! 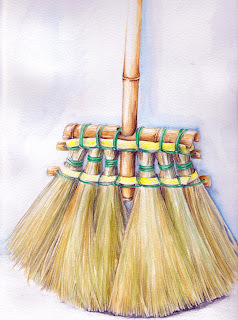 The broom is beautiful, as is your painting of it! I didn't really know that a broom can be so beautiful! Hello Debra! Thanks for your comments on my Bali Bird post. Actually it was partially inspired by your Lion dance sketches =) I kept thinking I wanted to do something similar too. Oh yeah, the shoes... hmmm I have the pictures taken on my Facebook account. But I can send you a message in the group with my email address, and then I could attach those pictures to you. But if that's too much trouble, here's the website. And I have the pair which the person's wearing when you Click the path that says "Click to see more views"
Great rendering of a really colourful broom. If I had a broom like this, I may even enjoy cleaning. Wow, terrific job on the broom. It's a unique one at least to me. You make it look so real. Better than a photo.